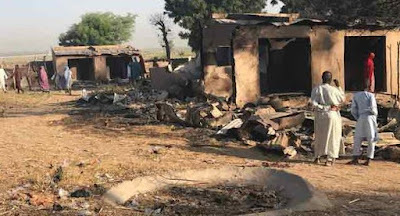 Eleven people have been confirmed dead while 43 others sustained varying degree of injuries in a twin bomb blast on the outskirts of Maiduguri in Borno state. The national and state emergency agencies, after the evacuation of the victims, placed the death toll at five while a Civilian JTF personnel, who participated in the exercise, said they had evacuated eight corpses while three out of the injured ones died at the hospital. The NEMA spokesman in Maiduguri, Abdulkadir Ibrahim, in a statement on Sunday, said: “Emergency response teams have confirmed that two female PBIED carriers detonated their explosives within five minutes interval at Muna-Dalti settlement yesterday evening (6/4/2019). His counterpart at the SEMA, Usman Kachalla, also corroborated him. “We have evacuated the wounded to the Specialist Hospital but unfortunately three persons dead at the spot (excluding the bombers) and 46 other are receiving medical attention at State Specialist Hospital,” he said. A source from the SEMA confirmed that three out of the wounded had died while receiving treatment at the hospital.